Music vs. Silence: Should You Listen to Music When You Write? 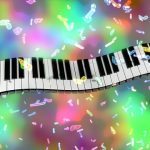 Does music help you write, or does it get in the way? Music has the power to stop the chatter in our heads, and it can shift our mood. Because music opens us to feelings, listening to it can help us get into that zone of deep concentration from which inspired work arises. But, music can also do the opposite. It can fill the silence just when we ought to be listening for the whisper of a story. Does listening to music help or hinder concentration? Many writers say they listen to music before they start writing, but once they begin, they write faster and better in silence. …the findings of this study revealed that it is the intensity of the music rather than the type of music that matters the most when it comes to cognitive performance, [but] it is still noteworthy to point out that scores were significantly higher when participants completed the tests in the silence condition [italics mine]. There are those, however, who argue just the opposite. Fred Patenaude, on his blog about boosting brain power, recommends Baroque composers as a way to enhance creativity and shift mood. My childhood was spent in a vast, generative desert of silence. I played clarinet, and playing in my school orchestra, as well as attending performances of the Youth Symphony, taught me to enjoy classical music. At home, we had a portable phonograph with a red leatherette case. My Grandma, who lived with us, had fifteen or twenty ’78s: Tommy Dorsey’s Big Band, as well as Western songs by Gene Autry, “the Singing Cowboy,” and greatest opera hits by Enrico Caruso. When we listened to the record player, we put aside whatever else we were doing and just listened. We couldn’t do anything “productive” because we had to anticipate the end of the record, or the needle would skip. After we finished listening and my grandmother returned the record to its sleeve, the house returned to the shush of footsteps on the carpet. Portable cassette players, boom boxes, Walkmen, MP3 players, iPods, and, eventually, smartphones and iPhones changed all that. Even Steve Jobs couldn’t have predicted the cultural shift. Now, it’s silence, not music, we must seek out. A decade or more ago I had the pleasure of attending a workshop at which author Stuart Dybek talked about the important role music played in his writing life. He credits music with allowing him to find his writerly voice. Hungarian composer, Zoltán Kodály (1882-1967) was a composer, ethnomusicologist, and inventor of a method for educating children about music. Three of my short stories began with a journal I kept while traveling in Turkey. I recorded sights, sounds, and smells of the Turkish countryside, but, I didn’t begin drafting stories until I returned home. By then the immediacy of first impressions had worn off. The sound track from Steam, otherwise known at Hamam: The Turkish Bath, helped me recapture the sense of strangeness and dislocation. I’m convinced that being able to enter that “feeling state” helped me write the stories in my prize-winning chapbook, The Rug Bazaar. (Read the stories for free by clicking on the book’s title and downloading the pdf.) One of the stories in this chapbook then became the title story of my short story collection, Bonds of Love & Blood. If you were a composer attempting to write a new song, would you listen to another song while you attempted to compose a new one? Intuitively, we all know this wouldn’t fly. I would counter that argument. Have you ever tried to concentrate when there’s a loudmouth at the next table? You can’t. Same thing if you’re trying to meditate. The whole point of meditation is to stop the chatter of the monkey mind and focus on the sound of your own breath. I’m with him. To write from that true, deep place, we must coax ourselves into a state of deep meditation. We must make friends with silence. For more Writing Tips, go here.